Jun 6 – Corpus Christi, St Norbert of Xanten, (1080-1134 AD), Apostle of the Eucharist & “Defenders of the Eucharist” | ADULT CATECHESIS & CHRISTIAN RELIGIOUS LITERACY IN THE ROMAN CATHOLIC TRADITION: hosting ONLY True Christians!! !, or "How to think Catholic!!" -by Peter Paul Rubens, Flemish, 1577-1640, oil on canvas c1625, Height: 434.3 cm (170.98 in. ), Width: 444.5 cm (175 in. ), The John and Mable Ringling Museum of Art – Sarasota, Florida. Please click on the image for greater detail. “In the sixteenth century, the denial of the Real Presence occurred again, along with a repudiation of the Mass as making present the redemptive sacrifice of Jesus. The Church’s response through the Council of Trent strongly reaffirmed these Eucharistic truths and sponsored the revival of Eucharistic devotions initiated in the Middle Ages. Perhaps the greatest eucharistic artwork from this period is Peter Paul Rubens’s oil painting entitled The Defenders of the Eucharist, created in 1625. 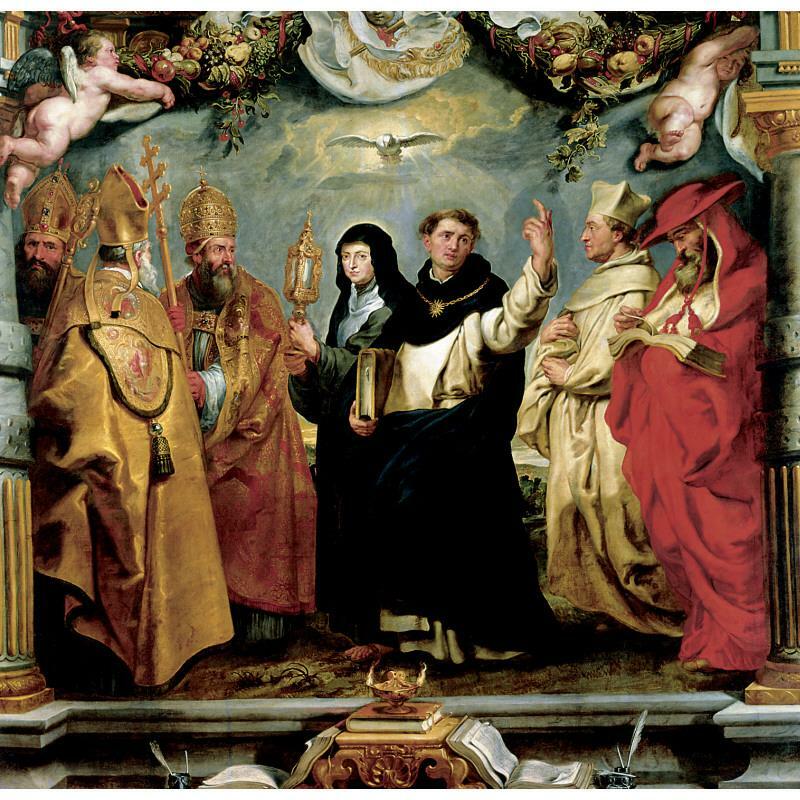 Rubens reached back to the golden age of the Church Fathers as well as to outstanding saints of the Middle Ages and assembled seven of them in one scene, united in the one faith of the Church witnessing their unity through the centuries of faith in the eucharistic presence of Christ. Today that painting is on display in the Ringling Museum of Art in Sarasota, Florida. Beginning on the right side of the canvass, Rubens pictures St. Jerome, dressed as a cardinal receiving Communion. Next to him stands St. Norbert, clothed in his white habit and carrying the Eucharist beneath his robes. St. Thomas Aquinas stands in the center holding a book and extending his other hand to heaven, a gesture proclaiming his defense of the Eucharist. Beside him is St. Clare of Assisi, holding a monstrance that displays the sacred eucharistic host. To her left is St. Gregory the Great, the pope who wrote so many works contained in the Mass. Then comes St. Ambrose, who wrote about the Real Presence of Christ in the Eucharist. Rubens finishes his gathering of defenders of the Eucharist with St. Augustine, who included his reflections on this sacrament in his famous treatise on the Holy Trinity. Rubens produced this painting during the Church’s Counter-Reformation efforts to defend and reclaim the authentic teachings about the Eucharist and the devotions that assisted believers to deepen their commitment to this mystery of faith. The seven saints represented in this painting summarize our belief in the Eucharist. It is a sacrifice, the sacrifice of Jesus made present in a sacramental way. It is a sacrament of the abiding presence of Christ in the transformed bread and wine become his Body and Blood. It is a sacramental meal begun on Holy Thursday and available to us in Holy Communion. “Seven saints march in procession together, gathered from disparate centuries to honor their Lord in the Eucharist. Each one displayed fervor for the Eucharist in his or her own time and spread that devotion to others. It was Peter Paul Rubens who assembled these saints in this painting called “The Defenders of the Eucharist.” Soon, the silent footsteps shown here will be imitated by the faithful in cities around the world, when we gather for Corpus Christi processions. Today, June 6, is the feast day of St. Norbert of Xanten, shown in the white habit of a cathedral canon. He is perhaps the least known of the seven saints here, four of whom are the great Fathers of the Latin Church: St. Augustine, St. Ambrose, St. Gregory, and St. Jerome. They are depicted in this order from left to right, with Augustine leading and Jerome bringing up the rear. In the center St. Clare holds the monstrance, and next to her St. Thomas Aquinas points towards Heaven, holding a tome representing his theology. What did St. Norbert do to earn a place among these others? He did not leave writings like the five doctors of the Church, nor perform a miracle as glorious as St. Clare’s repulsion of invading Saracens with a monstrance. But he did defend the truth of the Eucharist when a heresy arose in Belgium in the early 12th century. The town of Antwerp was persuaded by the would-be reformer Tanchelm that the sacraments were not real, a belief that persisted after his death. By his preaching, St. Norbert converted the whole town back to faith in the real presence of Christ in the Eucharist. Later, this truth would again be denied in the Protestant Reformation. This is part of the reason that St. Norbert was only canonized in 1582, so long after he died in 1134. He was held up as a model of faith to the wider Church, an “Apostle of the Eucharist.” Peter Paul Rubens included him in this painting in the 1620s, when Isabella Clara Eugenia, sovereign of the Spanish Netherlands, commissioned a whole series of paintings celebrating the Eucharist. St. Norbert’s connection to the Eucharist goes beyond his preaching against Tanchelm, however. When he was a traveling preacher at the beginning of his career, he carried with him hardly any possessions outside of what was needed to celebrate Mass. Sometimes he would celebrate more than one Mass in a day, and several of his miracles were accomplished in connection with the Mass. He was so devoted to the Precious Blood that when a poisonous spider fell in the chalice, he drank it rather than risk spilling any. The saint thought he would die, but a little later the spider came harmlessly out of his nose. He also healed a blind woman by breathing on her after consuming the Eucharist and drove out a recalcitrant demon from a young girl by having her present as he celebrated Mass. St Norbert, ora pro nobis!